The day we have anticipated has arrived. Whether one hears this reading from Isaiah on Christmas Eve or Christmas Day, it is a much-celebrated reading, if for no other reason than it forms one of Handel’s vibrant choruses in The Messiah. If you know The Messiah, you might find yourself easily joining in singing “For unto us a child is born, unto us a son is given.” As a bass, this is one of those choruses that I enjoyed immensely, because the bass part boldly leads out the chorus. Of course, there’s much more to Isaiah 9 than just the verse from which Handel drew that beloved chorus. The lectionary reading begins with a word about Light shining in the darkness. We’re told that the people “walked in darkness,” but they “saw a great light.” What was that darkness? In context, it is the threat of invasion, first from Judah’s neighbors Ephraim and Syria, and secondly from Assyria. This light that Isaiah speaks of is the hope that things are about to change. The reason we read this passage on Christmas may have its roots in verse 6, but the entire passage has a messianic feel. This is true even though no New Testament writer directly quotes from it. We’re told that the child spoken of in verse 6 will bring endless peace (well-being) for the “throne of David and his kingdom.” The traditional reading of verse 6, as seen in the reading from the NRSV, attaches four titles to this child, upon whose shoulders authority will rest. This child is named “Wonderful Counselor, Mighty God, Everlasting Father, Prince of Peace.” Whether originally intended by Isaiah, these titles have helped cement the church’s confession of Christ’s divinity. As with Isaiah 7, which we read on the Fourth Sunday of Advent, Isaiah 9 has an original context. We need to get a sense of what Isaiah originally had in mind before we can make application to Christmas (I will be basing my own Christmas homily on Isaiah 9). As with Isaiah 7, the prophet is speaking to a moment of crisis. It would seem that the northern regions of Israel have been captured by the Assyrians, ending one threat but offering a new one. There appears to be a moment of respite for Judah, who may be celebrating the accession of a new monarch. This song may celebrate the rise of Ahaz’s successor, his son Hezekiah. The good news here is that the land may have experienced darkness, but now a bright light shines into their midst. We’re told that God has broken the “rod of their oppressor,” so things are looking up for Judah. The siege has been broken and the heir to the throne of David has arisen. Upon his shoulders, authority will be placed. This is important, because the land of Judah finds strength in the promises made to David and his descendants. While Ahaz wasn’t a very good king or faithful servant of Yahweh, he was in the line of David. Now, the throne will safely pass to an heir. There is reason to celebrate here because the son is different from the father. Hezekiah would rule for nearly thirty years (715-687 BCE), and under his rule Judah would hold off the Assyrians and experience a period of peace. This is reflected in the words about the boots and garments of the invaders have been burned. All of this joy is rooted in the coming of a new king. Poetically, we hear word about the birth of a child, but it’s likely that the passage speaks not of birth, but of accession to the throne. As Blake Couey notes, “although the verse speaks of the birth of a royal child, it probably refers instead to the coronation of the king. In the royal ideology of ancient Judah, the David monarch became a son of YHWH at his coronation, as suggested by Psalm 2:7: ‘He said to me, “You are my son; today I have begotten you’ (cf. 2 Samuel 7:14)” [Feasting on the Word, p. 101]. Of course, as we hear the passage in a Christmas context, we hear not of a coronation but of a birth—most specifically the birth of a child in Bethlehem. The titles that appear in verse 6, which Handel made great use of, still demand our attention. While the NRSV follows the traditional pattern of suggesting four separate titles, which are attached to the child/king, perhaps there is a better way of looking at this. John Goldingay suggests that this is really a one sentence name. He reminds us that Isaiah likes long names to describe a person (even though these wouldn’t be the real name of anyone). So, the people call him: “An-extraordinary-counselor-is the warrior-God, the-everlasting-Father-is-an-official-for-well-being.” The name describes Yahweh, as the one who can figure out what to do about the future and bring it about. While reading these as titles has dramatic effect, seeing this as a name that speaks of what Yahweh can do, and is doing, and that the child stands as a sign of this commitment on God’s part is enlightening. Although the name speaks of God, it does not mean that the child is God. However, as heir to the throne of David, in a theocratically defined monarchy, the hope is that this child will represent the warrior God who will bring peace. While most translations use the words “eternal father” and “prince of peace,” Goldingay translates what usually appear as two titles as a description of the “eternal Father” who “is an official for well-being.” Goldingay notes that the word translated as official usually denotes an army officer, which connects this official to the “Warrior God” who brings about “well-being.” He uses “well-being” instead of peace to translate shalom, because it carries a broader meaning than simply peace. He writes: “This prospect is what the child’s name promises Judah” [Isaiah for Everyone, p. 43]. The word here is that the child/king will bring endless peace. As we gather for Christmas, the promise of peace is ever on our hearts. We hold on to the promise, even when peace is not present. I’m nearly sixty, and I have seen very Christmases where the world has been at complete peace. Indeed, the United has had few years of true peace. We might not have been at war, but tensions have been present. The same is true at this moment. Indeed, it is appropriate at this moment to remember Aleppo, a city under siege, where thousands have died or wounded and many more have been displaced. Do we care? Is their situation of concern to us? We remember this Christmas Christian brothers and sisters in places like Egypt, Iraq, and Syria who face extermination. Christianity has survived for generations under Muslim rule, but their ability to do so today is under threat. Indeed, they are being held hostage to conflicts that rage across the land. There is darkness out there, and the hope is that they will experience the light that is God. So, as we ponder this passage, let ask the question. As we celebrate the coming the child born in Bethlehem, how will the light of that birth shine in the darkness through our lives? We know that Christmas can be a time of great joy. It can also be a time of deep sorrow and loneliness. It can be a time of consumer driven distraction, or a time of peace and well-being. As we ponder the coming of this child, upon whose shoulders authority is placed, how might we be agents of peace and well-being in our world as his followers? Picture Attribution: Greco, 1541?-1614. 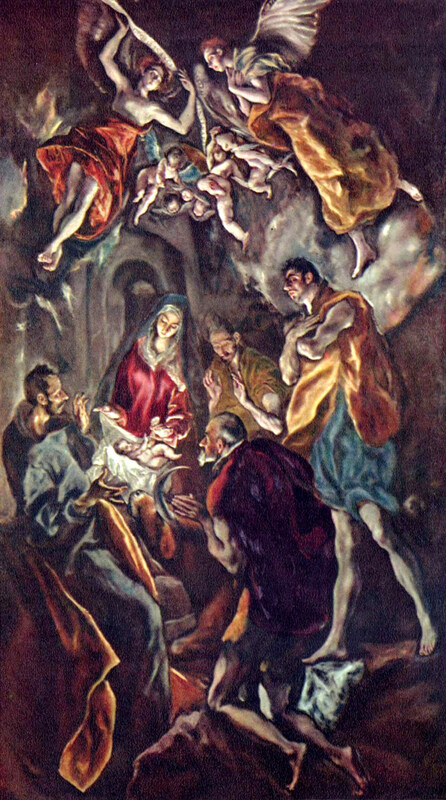 Birth of Christ, from Art in the Christian Tradition, a project of the Vanderbilt Divinity Library, Nashville, TN. http://diglib.library.vanderbilt.edu/act-imagelink.pl?RC=48042 [retrieved December 18, 2016]. Original source: www.yorckproject.de.